The Parliament in South Korea on Friday has impeached President Park Geun-hye over a corruption scandal that has shaken the country and fuelled public outrage. The National Assembly motion passed by 234 votes to 56, meaning some members of Ms Park's ruling Saenuri party voted to impeach her. Ms Park has been embroiled in a political scandal that led thousands of Koreans to take to the streets in recent weeks demanding her removal from power. Prosecutors say Ms Park had a "considerable" role in the alleged corruption, which she has denied. However, she has repeatedly and publicly apologised for her close ties with Ms Choi - who has no official post. Ms Park is the the first female president of South Korea and the daughter of a former military strongman who seized power to become president. Park will now be suspended from power with Prime Minister Hwang Kyo-ahn taking over as interim leader until the constitutional court rules on the motion within 180 days. If the court agrees to remove her from power, a special presidential election will follow in 60 days. If it upholds the decision, only then would Ms Park be dismissed. 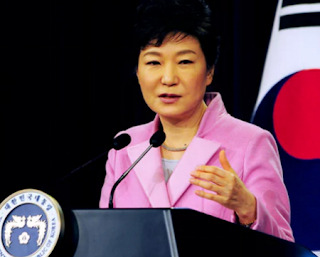 She would then become the first sitting South Korean president to be deposed in the country's democratic era.